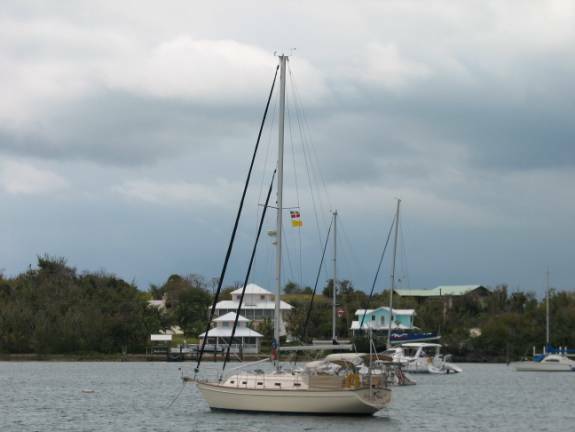 Green Turtle Cay: We anchored outside New Plymouth, the settlement on Green Turtle, for a couple of days in settled weather and worked on several boat tasks. 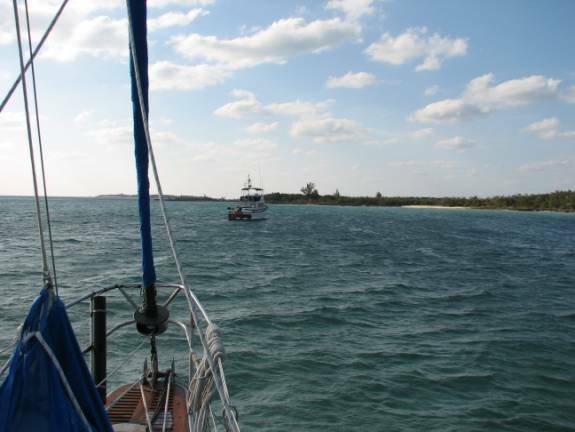 When another cold front was predicted, we took the rising tide up the shallow channel into White Sound, the northern anchorage on the cay. This is where we waited in January for 5 days for a weather window to go around Whale Cay into the Atlantic Ocean to get to the Sea of Abaco. There are two sounds on Green Turtle. White Sound, the northern bay is where the resorts and winter homes are located. 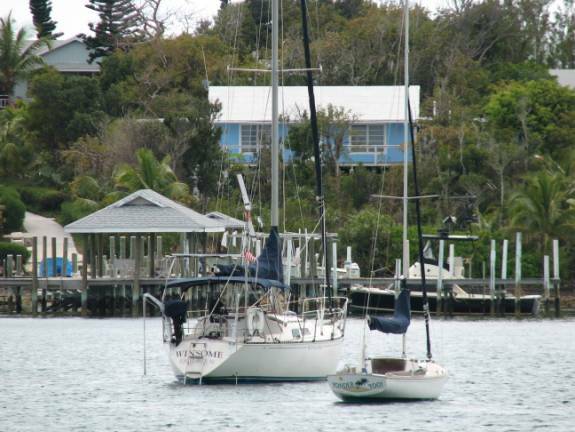 Black sound, the southern bay, is close to New Plymouth and where the native Bahamians live. We were surprised that we could hear roosters in White Sound, since most winter home residents would not have chickens running around the patio. We finally understood the White Sound roosters when we took our garbage to the local dump, which is near White Sound. There were chickens, roosters and chicks running about the dump. They had either escaped from their owners on the south part of the island and found plenty of food at the dump or are they truly “free range” and go to the dump for food but back south to roost. There were all kinds of computers, appliances, batteries, car and golf cart parts in one area, and a huge trench in the rock where we threw our garbage for eventual burning. Our friend from S/V Winsome lamented that the dump used to be well-organized discarded appliances sorted by type. With the growing wealth, there is less care take for organizing the appliances. Fewer people (locals) use the dump as their local Radio Shack. We scrounged around for plugs and ferrites. The price was right. 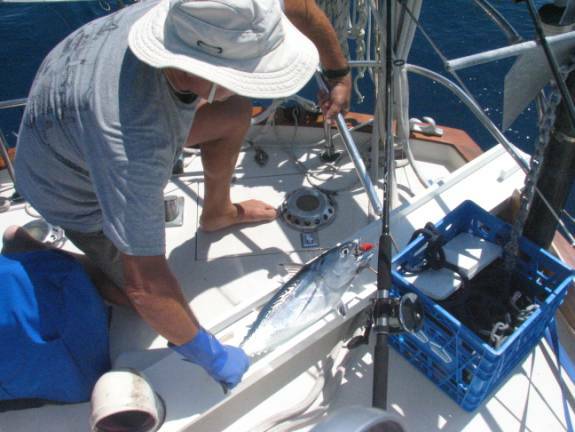 Saturday, between Good Friday and Easter, we motored further north so that we were well positioned to cross Little Bahama Bank and the Gulf Stream during settled weather. 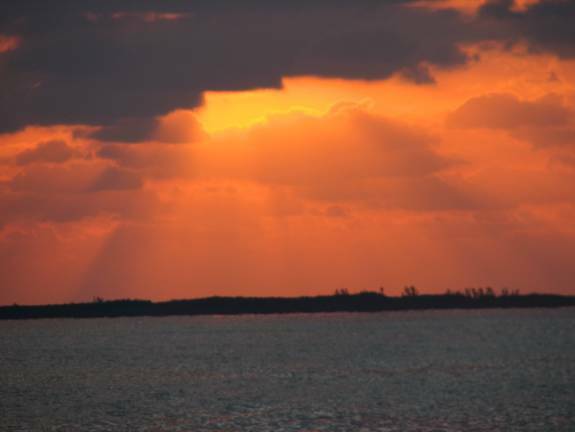 Little Bahama Bank and Gulf Stream Crossing: On Easter morning, we left Allans-Pensocola Cay just before sunrise, as soon as there was enough light to navigate out the channel and avoid the coral reefs that create the anchorage. There was no wind and no wave. We motored all day. When we were about 8 miles from the edge of Little Bahama Bank, the water in front of us looked very shallow; we were in 18 feet of water, and the chart did not indicate any lower depths in the area. The closer we came the lighter the colour of the water. Just before we entered the light water, we realized it was very cloudy. It was a very large (2+ miles across) fish mud. 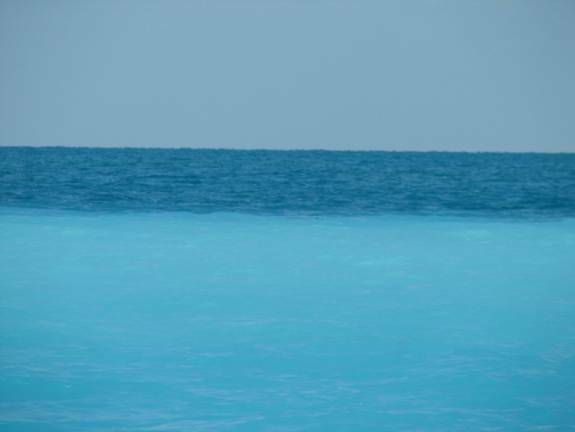 This is not uncommon on the Bahama Banks, and it is not fully understood. It is thought that large schools of bottom-feeding fish stir up the bottom. By 3:00 in the afternoon we began to feel the ocean swells. That was 4 hours before we got to the edge of the bank. 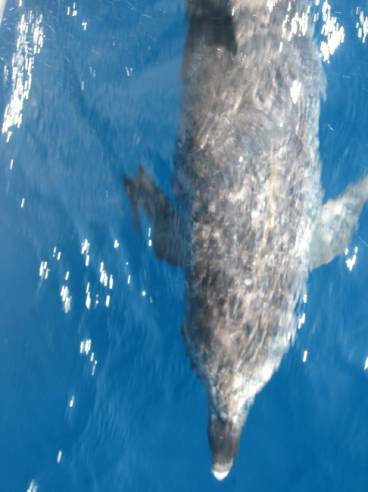 A family of dolphins swam around us as we were about to leave the Little Bahama Bank. It looked like a parent was teaching its young to ride a boat’s bow wave. Brian quickly brought in his fishing line, but the dolphins left us. We finished dinner about an hour before we got to the ocean (still daylight and no big swells yet). A small freighter passed about a mile in front of us, and just as we finished dinner, a very tiny (3.5-4 inches long) bird landed on our aft deck. We think it must have been flushed off the freighter since we were far from land, and the bird seemed to be young (downy and small). We think it was a sparrow of some sort. 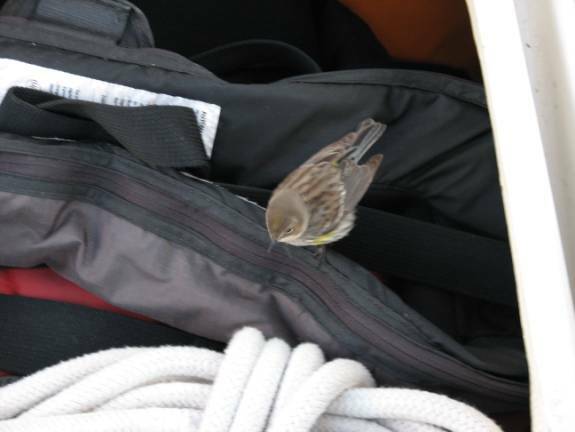 The bird investigated the aft deck, then went to the bow, and suddenly was in the cockpit, pecking at one of Brian’s fishing lines. It kept moving; it was in one of the cockpit cubbyholes, and then suddenly flew into the aft cabin! Brian followed it, plugging the emergency tiller opening with a small pillow (we did not want to have the bird fly into the aft bilge and not be able to find its way out). The bird seemed to vanish. Five minutes later, we found it in the forward cabin. We decided to let the poor thing stay rather than flush it out. It was frightened and very tired. 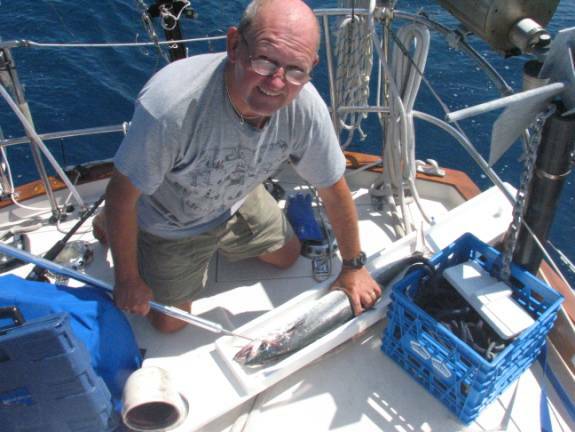 Brian opened the centre cabin hatch so that it could flee if it wanted to. In the morning the bird flew out on the deck. We were within 5 miles of land, and we hope it had gathered enough strength to find a new home in Florida. As we approached the fastest current in the Gulf Stream, the waves became wicked. They weren’t that large, but seemed to corkscrew the boat and slam it around. Things went flying in the cabin, even stuff we thought was quite secure, like books and the plastic boxes with our hatch screens. We were sure the little bird wished he had drowned back in the Bahamas. We wondered if we would find it dead in the morning. (Obviously not) We think the little creature found the calmest and warmest place on the boat, in the passageway between forward and aft cabins next to the engine room, because we discovered a few droppings there after we docked. The wicked waves continued for about four hours, from 10:30PM until 2:00 AM. 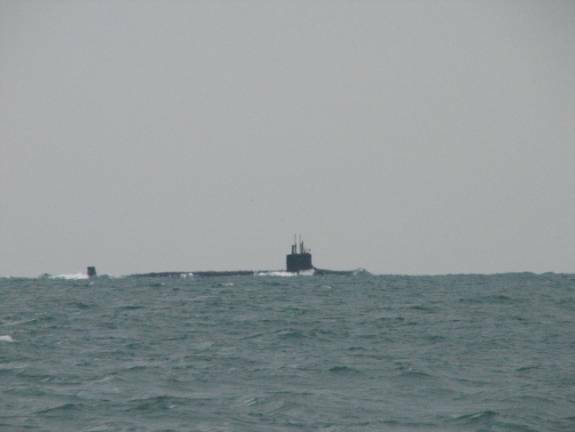 During this time, we encountered two casino boats, a freighter, two cruise ships, one coast guard cutter, a couple of commercial fishing boats, and near the entrance to Cape Canaveral, a Triton submarine. The wind piped up to 12 knots from the NW for the last three hours. The reason we had such terrible waves is that from Thursday to Saturday there was a moderately strong north wind; this blew against the current, causing steep waves. Although the wind was calm on Sunday, the little bit of wind stayed north, keeping the steep waves from lying down. 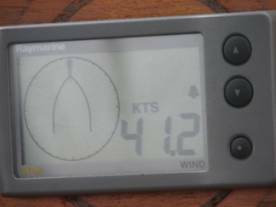 At 6:30, with the 12-knot NW wind and moderate waves (since we were out of the Gulf Stream by then) our speed was down to 6 knots. It would have been a tough 30-hour slug to continue up to the St. Mary’s River at the Florida / Georgia border. It also threatened to rain. So…we ducked into Cape Canaveral until the weather cleared. 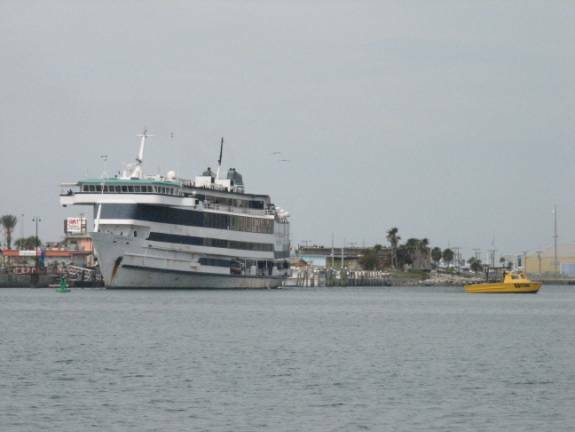 Remember the story of “The Little Engine That Could” … marine version … yellow boat is ‘TowBoat US’ the other is a floating Casino … between them is a large cable. Cape Canaveral to Charleston: After two days of wind and rain in Cape Canaveral, the weather cleared. We left for Charleston, about 250 miles away. The wind was light for most of the two days, so it was motoring all the way. The worst weather was on the first night when a thunderstorm raged all around us, but not on us. We had no rain, but a spectacular display of light. 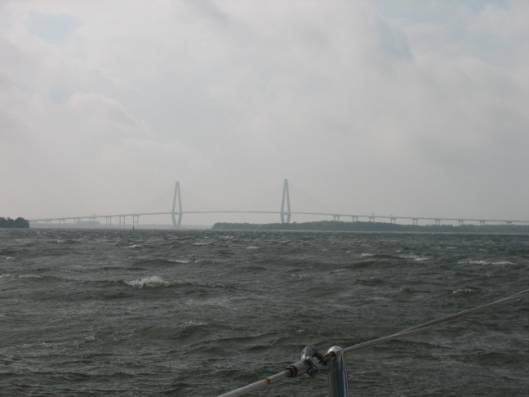 The wind after the thunderstorm was 15-20 knots, but the waves were high and we did not feel comfortable going out on deck to get the mainsail up. In between catching the two Kings, Brian brought in his line when a number of Bottlenose Dolphins came by to play with us. Jane first saw three dolphins jump together in the air … just like at Sea World. Then we saw them swimming for the boat; they must have been swimming close to 20 knots; they could swim circles around and under us. Brian went to the bowsprit and managed to get some movie footage of two of them riding and playing in our bow wave. What a treat. Our second day out, as we reached the northern part of Georgia, we were inundated with flies. We hadn’t seen them all winter. These were annoying biters; the flyswatters (which now have rusty handles from the salt water) went into use. The third morning we arrived at the long entrance channel to Charleston just as the sun was coming up. We followed a container ship into the channel. 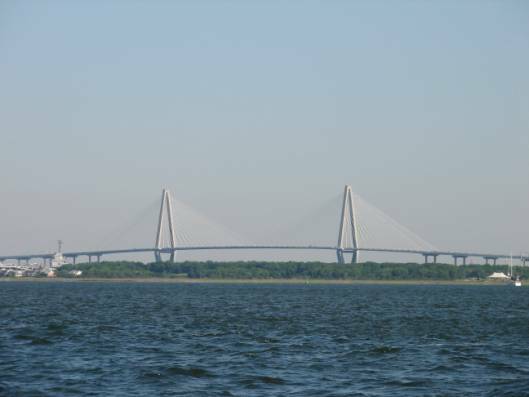 It is about 10 miles to get into Charleston harbour, and then another 5 miles up the Ashley River to the anchorage just outside the City Marina. We anchored at 10:00. As we came in the channel, there were over 100 racing sailboats going out to the Atlantic, from 20-feet to 50+ feet, outfitted with the latest sails and gear going out for an all-day race. These were very serious racers; many wore shorts; we were in sweaters and long johns. The ocean was cool at night and the 10 knot breeze made the sweaters and jackets (with hoods) feel cozy. Provisioning and Waiting in Charleston: The day after we arrived in Charleston, severe weather was predicted. We decided to go to a marina to let the front pass. 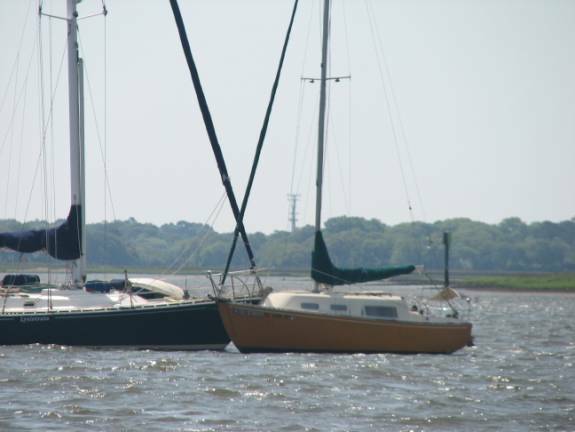 There was no room at Charleston City Marina (closest to the anchorage), so we motored down the Ashley River and up the Cooper River to another marina. The weather was dramatic. We were under a tornado watch for 12 hours, with downpours, wind up to 55 knots, and wild waves, especially when the wind was blowing counter to the strong current in the river. We were glad to be at a dock and had our lines doubled and tripled-up. The boat was bouncing so much, it was difficult to get off to the dock. 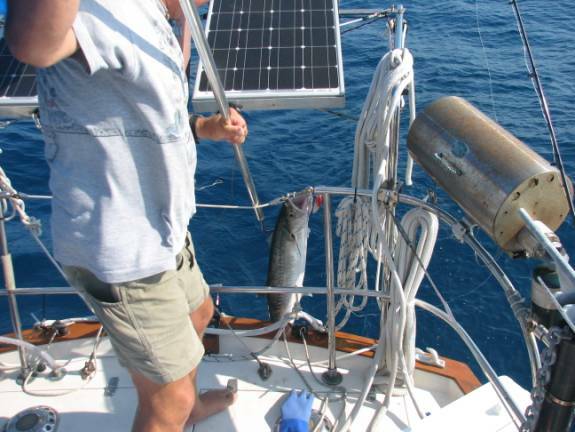 At one point Brian was on the bow, and it was bouncing 5-6 feet, almost burying the bowsprit. After three days, the weather calmed and we moved back to the anchorage. 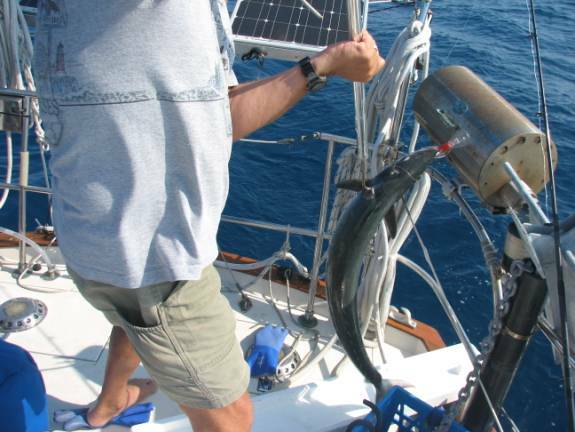 We took the dinghy to shore and bought supplies for boat projects we needed to accomplish before we cross the Atlantic. 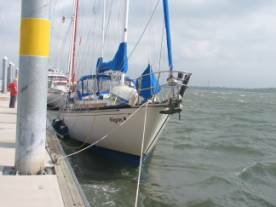 The last week of April we moved to City Marina, received shipments of mail and various suppliers, bought 3-months of groceries (and catalogued and stowed them), filled the fuel and water tanks, and decided we were good to go as soon as the weather window presents itself. The Charleston City Marina is an excellent facility with its (no kiddin’) MegaDock that is 4 city blocks long. We were at the far end, which meant if we wanted to use the on-shore facilities, we had to plan ahead. 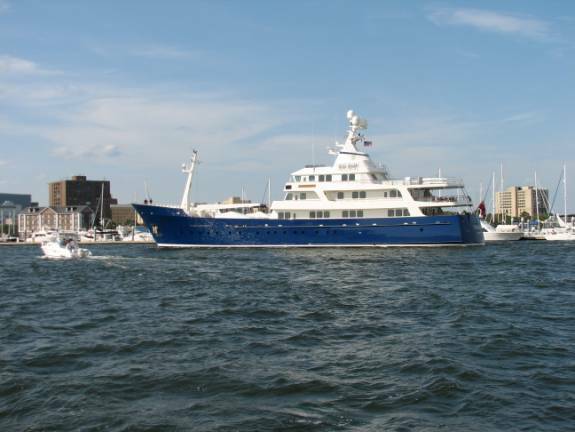 The MegaDock attracts MegaYachts that made us feel like pygmies. 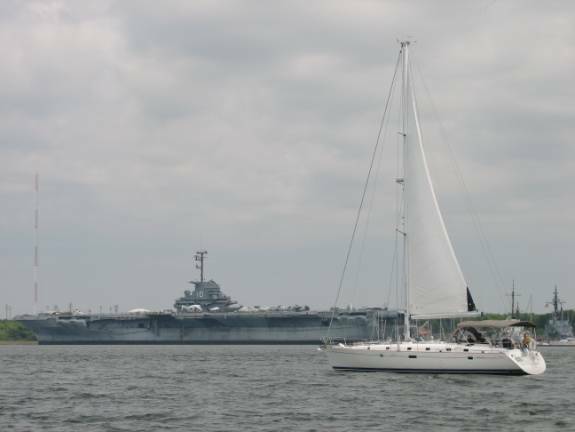 There were both power and sailboats that were well over 80 feet long with masts over 100 feet tall. Themis carried not only a couple of dinghies, but their own golf cart and 6 bicycles for the crew to get around the MegaDock. 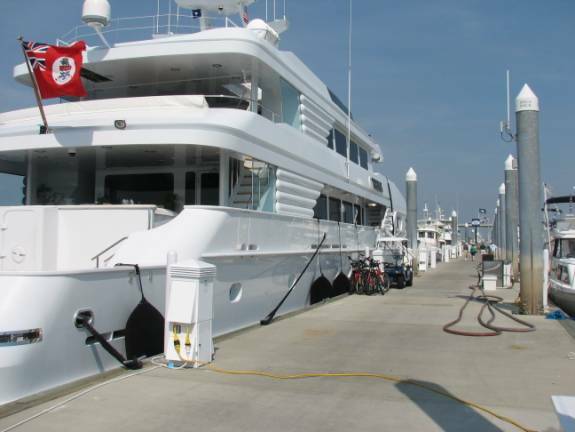 This morning, as we were preparing to leave the dock, “My Marilyn” from Washington D.C. arrived. 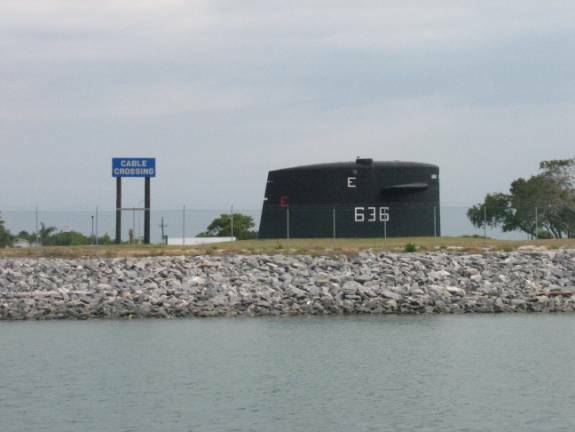 It is 112 feet long, and snugged itself into a 120 foot dock space with the help of its thrusters and engines. They needed to take on fuel. 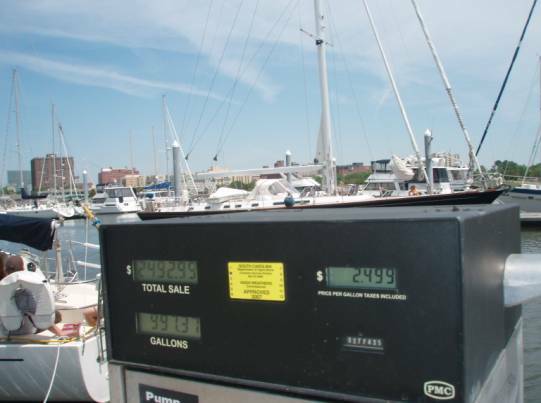 We think they said “2000 gallons.” When we passed the diesel pump it read 998 gallons (over $2000 of fuel) and they were still going strong when we left the dock. There were 8 boats in the 100+ foot category during the week. This evening, the granddaddy of them all came in. 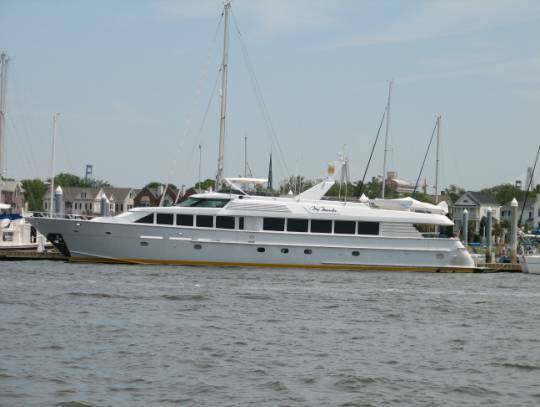 We are guessing it is about 150 feet, with 4 decks above the water line. We were wrong. It was Turmoil, at 209 feet 5 inches. 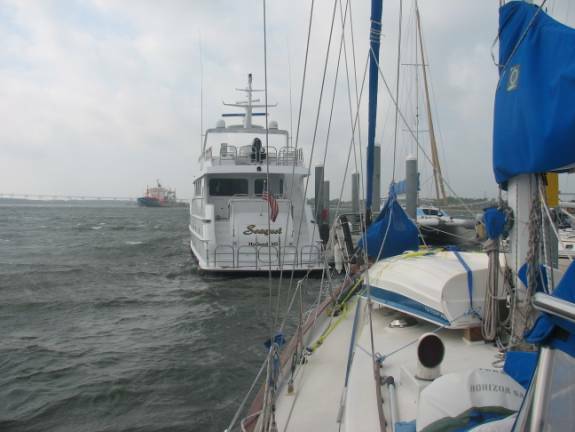 Turmoil, which was built in 1996 is a poop-deck, expeditionary-style boat with the lines of a commercial ship. “Turmoil” actually … it creates havoc wherever it goes. We are back at anchor, monitoring the weather, and listening to Herb Hilgenberg the meteorologist who helps cruisers get across oceans with a minimum of weather incidents. Once we leave Charleston, it will take about 18-25 days to get to the Azores. If you want to know where we are during the next month, at the top left-hand corner of our web page you will find “Pilgrim’s Current Position.” Click on it and it will show you our latitude and longitude on a map (you may need to scroll out to see the entire ocean to see how far was have crossed.